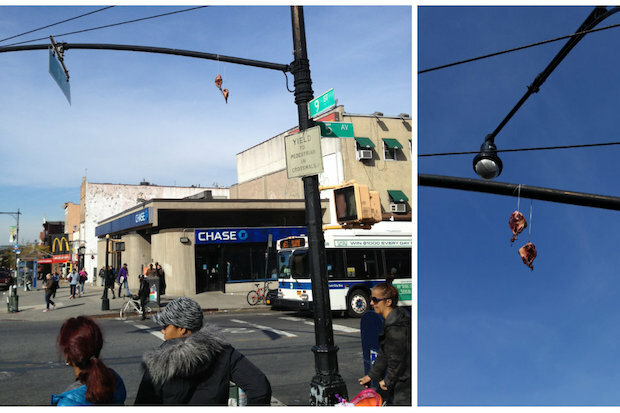 PARK SLOPE — A pair of skinned animal heads were found dangling from a street light at a busy Park Slope intersection Tuesday morning, police said. At least one witness called 911 after spotting the bloody skulls, which appeared to be goat heads, attached to a piece of twine hanging above Ninth Street and Fifth Avenue — sparking a police investigation, officials said. Man tries to remove animal heads at Ninth St and Fifth Ave. in Park Slope. Uniformed officers showed up at the scene shortly before 11:30 a.m., as passersby walked by apparently unaware of the gruesome sight just feet above their heads. The skulls dangled in the wind until shortly before noon, when a staffer from a nearby car service company, Continental Car Service, carried a ladder to the pole and knocked them down with a stick. The man, who declined to give his name, then threw the heads in the garbage. A Twitter post with a photo of the grisly sight quickly generated questions and speculation. Some wondered whether it was Santeria, a Halloween prank or voodoo. "Maybe it's some of those wackos who go for Santeria or voodoo," said local resident Louis Katenzakes. "It's the occult. They do rituals. They kill animals." Lorenzo Hernandez, a butcher at Alnoor Halal Meat Market on 21st Street off Fourth Avenue, said the heads appeared to belong to goats and they appeared to be cut by hand, not by a machine. He said goat meat is sold at many butchers on Fifth Avenue and that his market sells the meat every day. "Most people use it for food," Hernandez said. "The head especially, for soup." The sighting wasn't the first example of animal body parts discovered in the area. In March, severed goat heads and rooster heads were found in Prospect Park. Mohamed Almerdaie, who is from Yemen and whose family owns the building on the corner where the heads were found, said he's accustomed to seeing goat heads, but not hanging from a pole. "In my country... You take the head off, then you put it in the oven. It tastes good. It's expensive, too. They say it's good for the body," said Almerdaie, "Over here, I don't know what it means." Still, other locals said they were unmoved. "It's New York. I've seen the towers come down, so beyond that, nothing really stings that bad," said J. Sapp, 43, who works in the area.